Well, these days are always difficult to wake up on. Starting a week you really don’t want too. Unfortunately, I fall into the group that does not like Mondays. When and why do Mondays have to be so horrible, I am sure some people have there own kind of “Mondays”. What really causes us to dislike the day? Is it because we have something planned? Or needed to be done? I am sure there is something. 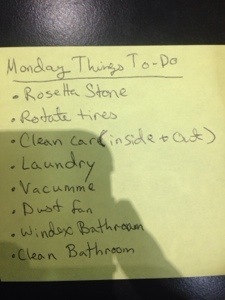 For me, I have many things I want to complete today. I need to ship a book, clean my room and bathroom, and so much more. Only so much can be done to your car at one time, and I have gotten the oil and air filter changed out, so one of the last things I, personally, can do is wait while people rotate my tires. That is what I am doing, right now I am getting my tires rotated. Anyways, busy days are hard to wake up for. You think you would have more time, but to everyone else they usually want their things done right then. Anyways, I hope everyone gets everything they need done on this somewhat gloomy day. Get some coffee and start your week, we can do it!